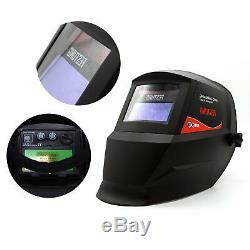 Pro Solar Auto Darkening Welding Helmet Arc Tig Mig Mask Grinding Welder Mask. 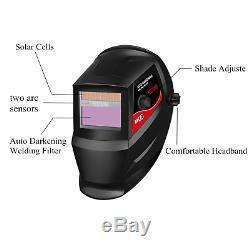 Auto-darkening welding helmet provides enhanced performance with 2 premium sensors at an affordable price. It offers operator comfort due to its lightweight construction and versatility. With superior performance, durability and flexibility, helmets offer exceptional value in personal welding protection. · Enhanced performance- Two arc sensors for high response. · Lightweight- Only 17.6 oz (500 grams) for optimum comfort. · Variable Shade- Adjustable welding shade levels from 9 to 13. · Responsive lens switching speed- Up to 1/25,000 sec! · Adjustable delay controls- Selection for switching speed: "short" = 0.25s to 0.35s "medium" = 0.35s to 0.50s "long" = 0.50s to 0.80s. · Sensitivity and Delay Control - 0.10 1.0 sec. · Welding and Grinding modes: Suitable applications include Stick (arc welding), MIG (Metal Inert Gas) TIG (Tungsten Inert Gas). · Screen area- 3.62" x 1.65". · Solar-powered: powered welding helmet with auto-darkening filter switching from light to dark in 1/25000 second. · Certified- CE, ANSI Z87.1, ROHS, ISO9001, CSA Z94.3. · Optical Class: 1 / 1 / 1 / 2. · Screen Area: 3.62" x 1.65". · Cartridge Size: 4.33" x 3.54" x 0.39. · Light State: DIN 4. · Low Volume Alarm: YES. · Dark State: Variable shade, 9-13. · Shade Control: External, Variable. · Power On/Off: Fully Automatic. · Switching Time: 1/25000S, from Light to Dark. · Dark to Light: 0.1-1.0S by infinitely dial knob. · Low Amperage TIG: 10 amps(DC), 10 amps(AC). · Sensitivity Control: Infinitely adjustable from Low to High. · Power Supply: Solar cell(change required2×CR2032 lithium battery). 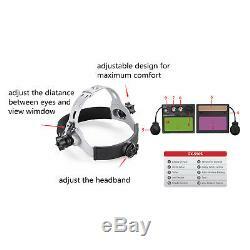 · 1 PCS x Welding Helmet. · 2 PCS x protective plate. · 1 PCS x UV/IR Filter. Most of our product could be delivered to 48 states of America (excluding FPO, APO or PO Box addresses). We only accept the return for original package. Please make sure the item have NO man-made sabotage. All products are rigorously tested before leaving the factory, if you receive products damaged or with quality problems, please do not hesitate to inform us with a photo that can be used as evidence. Look for our value-oriented items in the Fashion & Beauty, Home & Garden, Sports & Fitness, Outdoor & Living, Pets Supplies categories. We are always looking to bring new and innovative items to our catalog, so contact our Customer Service department with any suggestions you may have! For mailing purposes or for our local Pick-up option (available on select items), most of our items are located in Atlanta. Please kindly schedule your visiting time advance. Please refer the above info, thank you. The item "Pro Solar Auto Darkening Welding Helmet Arc Tig Mig Mask Grinding Welder Mask" is in sale since Friday, June 1, 2018. This item is in the category "Business & Industrial\CNC, Metalworking & Manufacturing\Welding & Soldering Equipment\Welding\Welding Protective Gear\Welding Helmets". The seller is "ainfoxus" and is located in ga. This item can be shipped to United States. Screen Area: 3.62" x 1.65"
Cartridge Size: 4.33" x 3.54" x 0.39"